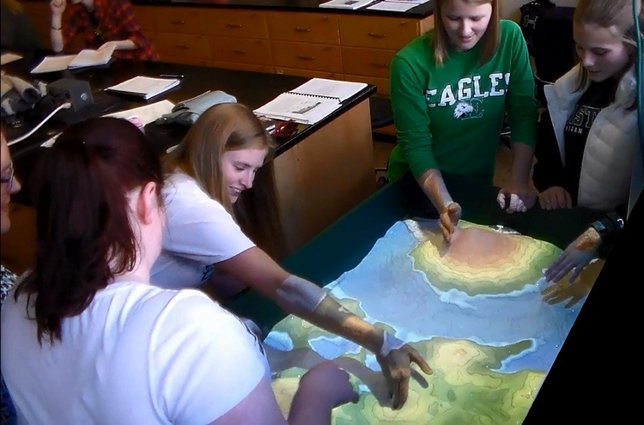 A professor at Eastern Michigan University (EMU) is using an augmented reality (AR) sandbox to help students understand earth science concepts through interacting with simulated topography. The AR sandbox combines an actual sandbox with a 3D camera, a digital projector and a computer to display a topographic map that adjusts as sand is moved around inside the box. As users move sand, a virtual map adjusts to reflect the new topology. Users can also hold their hands above the sandbox to create "clouds" that trigger simulated rain to fall and flow down geographic features to form rivers and lakes. Katherine Ryker, an assistant professor of Earth science education, built the tool using a physical sandbox, a Kinect camera, a digital projector, a computer and open source software originally developed at the University of California Davis with a National Science Foundation grant. Ryker's project was funded through a grant from EMU's Faculty Development Center's eFellows program, which provides funding for technology-based projects to enhance learning. "The sandbox has attracted campus-wide attention from academic departments, ranging from children's literature to the ROTC, each interested in utilizing the sandbox to fit their curriculum," according to a news release. "It's exciting to see that it is a technology with a diverse set of applications outside of just geography and geology," Ryker said in a prepared statement. For more information about the sandbox, visit lakeviz.org.